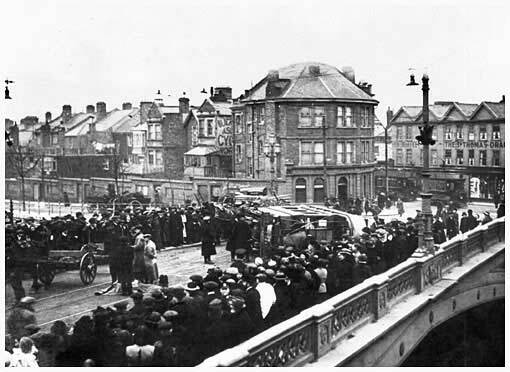 The following articles and photographs illustrate some of the public transport that has been used in Exeter since the turn of the 20th Century. 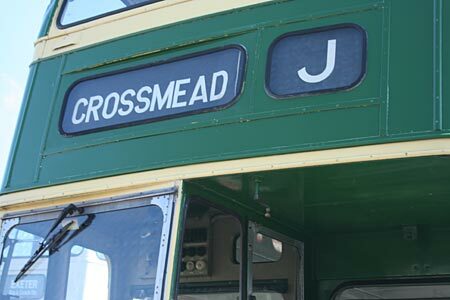 I am not an expert on buses and trams and would welcome any comments or additional photos of buses or memorabilia, from those that are. 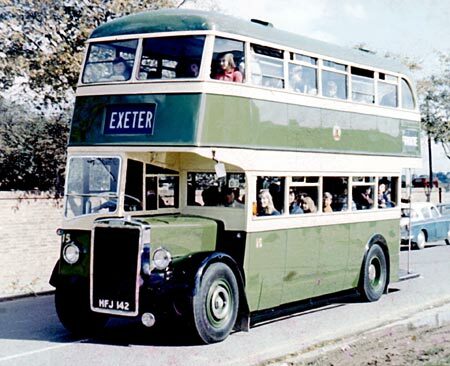 In addition, any stories from those of you that have used Exeter's buses and trams would be very welcome. It was on the 15th November 1881 in the Black Horse public house in Longbrook Street that final plans were made to introduce a horse drawn tram service to Exeter. The routes covered the east and north of the city, from St Davids Station, past the Clock Tower, New North Road to Sidwell Street and Mount Pleasant. A second route ran from Eastgate to Livery Dole along Heavitree Road. The company had planned to run down the High Street, but they encountered opposition from the traders. 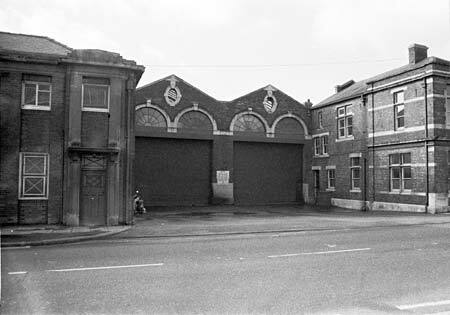 The tram shed and stables (photo right, since demolished), which belonged to Mr Paul Collings of the Black Horse, was situated in New North Road, between to the Old Fire House and Locomotive Inns. The first car ran on the 6th April 1882 from the Bude Hotel, Sidwell Street to St Lukes College. The last horse drawn tram ran on the 4th April 1905, when it preceded the first electric tram at 12.32pm from the Guildhall. It turned off down New North Road, to the tram shed and retirement. 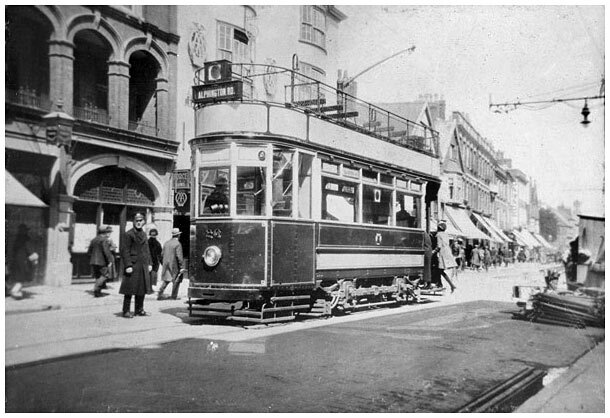 The first reference to introducing an electric tram in Exeter, appears in the Council Minutes of 10th September 1898. On 23rd May 1903, the Exeter Corporation Bill was passed, allowing the Council to purchase the horse drawn tram system from its private operators. The company was purchased on the 1st February 1904, at a cost of £6,749, inclusive of 22 horses. The way was now open for the City Council to introduce electric trams. A larger, and more reliable power station and a new Exe Bridge, with a flatter roadway were planned, along with new routes along the High Street to Cowick Street, and along Queen Street and St Davids Hill to St Davids Station. In addition, the Sidwell Street route was extended to Pinhoe Road, by the cemetery, and to Wonford Bridge on the Heavitree line. The old New North Road line was ripped up. A tender for the tram system was accepted from Westinghouse for £42,055 and on 13th August 1904, 400 tons of iron rail were unloaded from the steamship Vulcan, at Exmouth Docks. A site at Haven Banks was found for the new electricity generating station and work on a new Exe Bridge, designed by Sir John Wolfe Barry commenced. The electric trams would be housed in a shed on land purchased from Sclaters Nursery at the bottom of Paris Street, a site which is now housing, next to the Pyramids Swimming Pool. The first test run was on 24th March 1905 when at 11 in the evening, a brand new electric tram emerged, with all lights blazing from the tram shed and drove to Livery Dole. At 12.31 on Tuesday 4th April 1905, the Mayor E C Perry took the controls of the first tram of five to run along the High Street, down Paris Street to Livery Dole and back to the Guildhall. The Mayoress was presented with a bouquet with an attached shoe from one of the retiring horses. 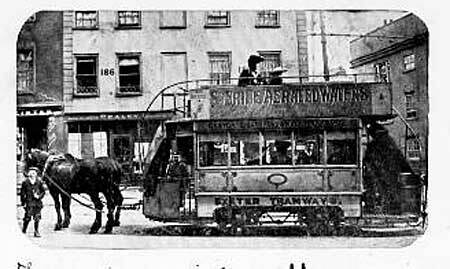 The procession was led by one of the old horse trams; the 22 horses were sold off for the total of £282-8-0d. Within a short time, more than 100,000 passengers per week were being carried. A branch line from the Exe Bridge, along Alphington Street to Stone Lane was introduced in September 1906. The First World War saw many of the systems workers sent to the front, and women conductors were introduced for the first time. The great tram crash of 17th March 1917 was the only known fatality on the system. The shortage of men, and spare parts led to an inevitable decline in maintenance and by the end of the war, the system was in poor condition. 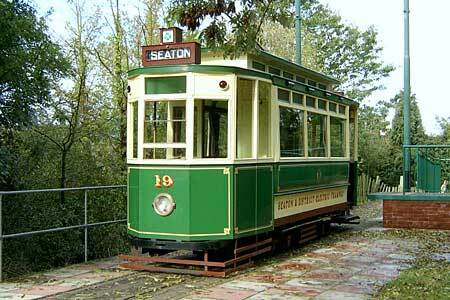 Through the 1920's the system was repaired and improved, with new tram cars introduced. In 1929, single decker buses were introduced by the Council as feeders to the trams. 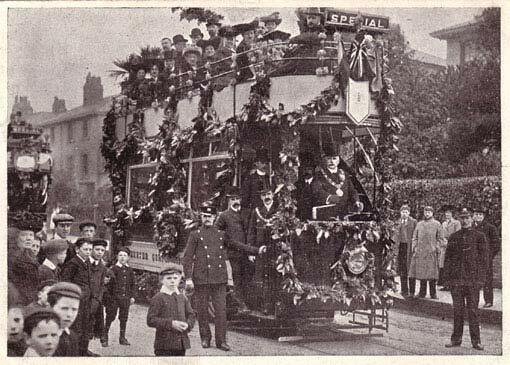 Their success led to a decision to replace the trams with buses and on 15th August 1931, the last flag bedecked tram was driven by Councillor Perry into the tram shed for the final time. 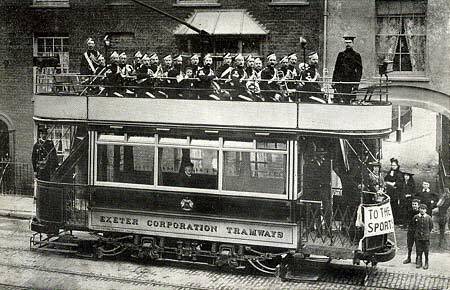 Councillor Perry at the controls of the first electric tram to run in Exeter on the 4th April 1905. 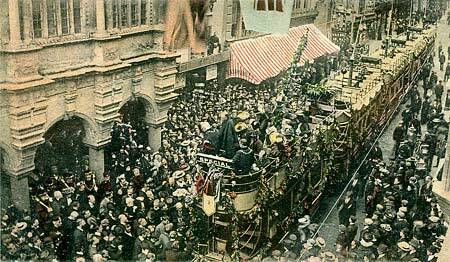 The procession of five trams was preceded by the last horse tram to run in Exeter - ironically, this was the first and last time a horse tram ran down the High Street. Five trams line up beside the Guildhall at the opening of the tram system on the 4th April 1905. It was a big year for Exeter because the coming of the trams had required the opening of a purpose built electricity generating station at Haven Banks, and a new, flatter, Exe Bridge. 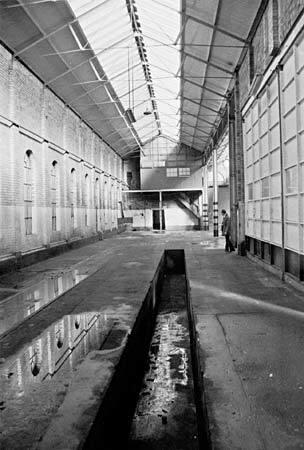 An inspection pit inside the tram shed; tram lines can still be seen on the left. The photo was taken after it ceased being used as a bus depot. There was a large bus park at the rear, with new doors installed to allow access for the buses. The electric trams had a new shed built in what is now the Heavitree Road, just below the Pyramids swimming pool. 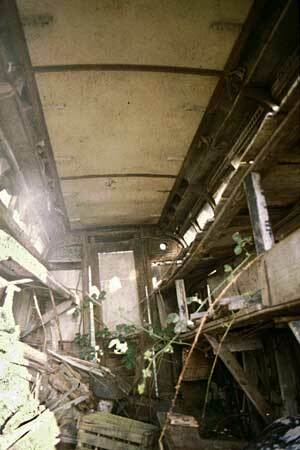 When the service was withdrawn and replaced by buses, the shed was converted to housing the new fleet. A band is carried on the top deck of an Exeter Corporation tram - this may be Cowick Street judging by the background. The sign on the front says 'To the sport' which could indicate an event at the County Ground, nearby. The first reference to a motor bus in Exeter was when an advert appeared in the Flying Post in January 1903 for a motor bus service in the city - "A motorbus will shortly be in Exeter for passenger traffic to and from ST ANNE'S CHAPEL and EXE BRIDGE". The advert continued - "SHORT DISTANCES 1d - 2d ALL THE WAY". I have not established whether it ever ran and apart from later private charabanc operators, there appears to have been no serious bus service until the demise of the trams. 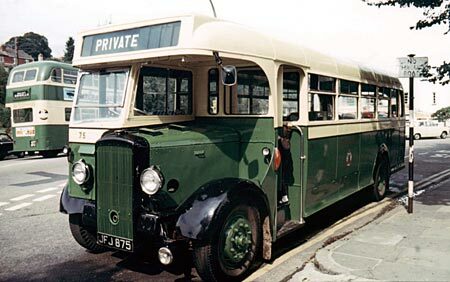 Through the 1920's, Exeter Corporation Tramsways attempted to modernise their fleet and track, following the First War and improve its service. However, Exeter Corporation decided to introduce a limited bus service in April 1929, to supplement and feed into the tram system. A year later, congestion caused by single lines and increasing motor traffic resulted in the Corporation deciding to close the tram service and convert local transport to buses only. The last tram, no 14, disappeared into the tramshed on the 19th August 1931. The initial three on loan buses was increased by a purchase of 6 AEC Regent double deckers. Route letters were introduced to avoid confusion with the numbers used by Devon General and through the 1930's, the fleet was gradually enlarged. The Second World War forced the introduction of a restricted service in the city, with some routes amalgamated and some abandoned. In 1943, all services were stopped at 9pm due to fuel shortages. At the end of the war 13 Daimler single deckers were delivered as the service recovered from the restrictions. Devon General had been providing a longer distance, county wide service since 1919. 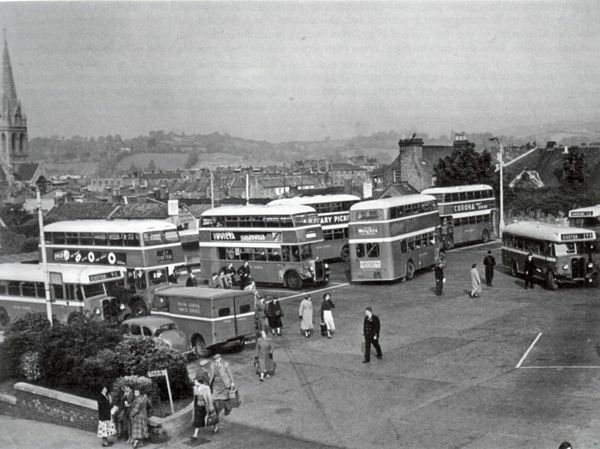 In 1947 Exeter Corporation agreed with Devon General to jointly operate some routes within a ten mile radius of the city to prevent unnecessary duplication. In the same year 17 Leyland PD2/1 double deckers were delivered, and for the first time, adverts were carried on the side of the vehicles. Exeter Corporation lettering was removed from the bodywork and replaced with City of Exeter. 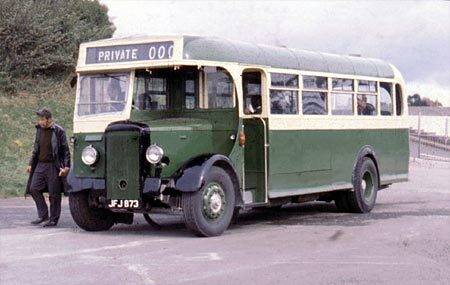 In 1954, an attempt to sell the service to Devon General fell through, and the following year, with a new Transport Manager in place, 10 Guy Arab vehicles were ordered for delivery in 1957. In 1963, the old bus station at Paul Street was closed and the large, open station off Paris Street opened. Times changed, and with increasing car ownership, the first high-capacity single deckers were delivered in 1966, with a view to changing to one man operation. 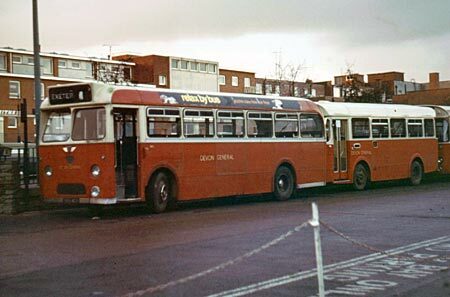 However, the end was in site for the City run bus service and in 1969 it was sold to the National Bus Company, to be operated by Devon General. 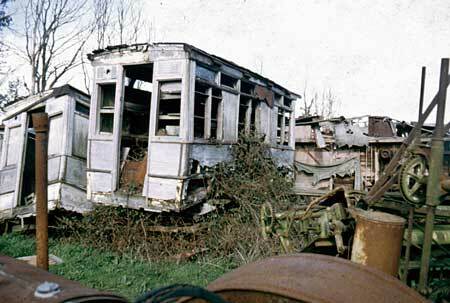 The last green and cream City of Exeter service arrived from Crediton on 31st March 1970 at 23.30. In 1984, Devon General took delivery of the first 16 seater Transit minibus vehicles to be used in a British city. The privatisation of the National Bus Company saw Stage Coach take over services in Exeter and East Devon in 1995. 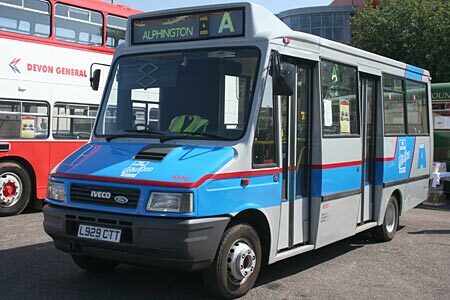 Since then, the fleet of buses in Exeter has evolved - larger, slim buses, with easier access for the disabled, to suit the narrow streets have been introduced. New Paul Street bus station was leased from the City Council from 25 December 1930 by Devon General. An existing building was converted for the ticket office and toilets. The council built the Information Bureau on the corner of Queen Street. 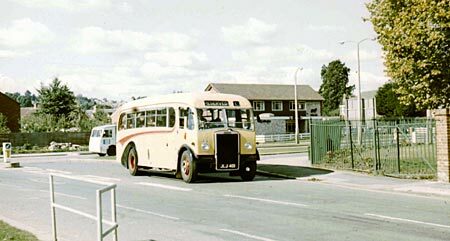 Exeter City buses used the terminus from 1947. 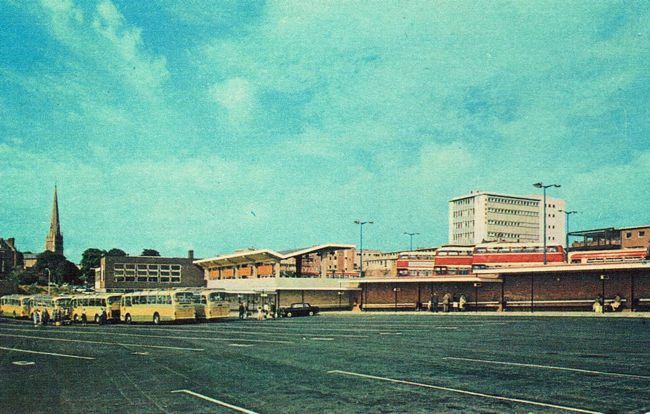 It closed on 5 July 1964 when the Paris Street bus station opened. New Paris Street bus staion opened on 5 July 1964. It was designed with a large parking area for visiting long distance coaches and coaches running day trips around Devon and Cornwall. This photo shows several Greenslades coach. Photo © Martin Parr - used with permission. 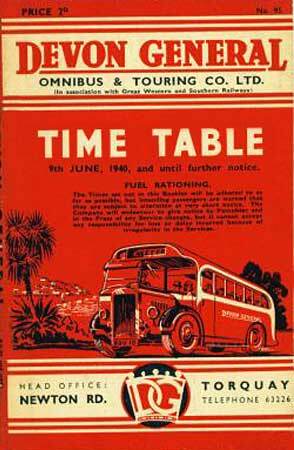 The cover of a Devon General timetable for 1940 when the service was restricted due to petrol rationing. The red liveried Devon General offered a regular cross county service. 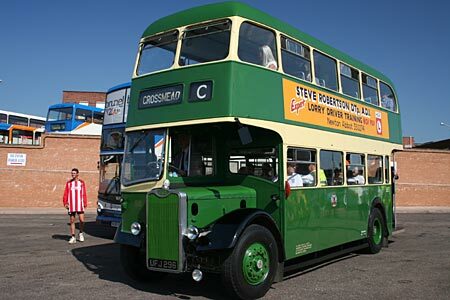 The Exeter Corporation ran a local service and were in Exeter's traditional green. A 1950 Daimler CVD6 single decker photographed in the 1970s, probably at a bus rally. Photo courtesy of Alan H Mazonowicz. 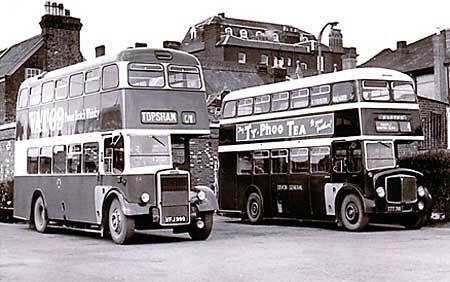 Left is a 1958 Leyland PD2/40 chassis and MCW body at the old Paul Street bus station. Notice the roof of the Rougemont Hotel in the background. On the right is Devon General service. This is a 1947, Leyland PD2/1 chassis, with a Leyland body. Its registration number is HFJ142 and was photographed on a bus rally in the 1970s.Photo by Alan H Mazonowicz. 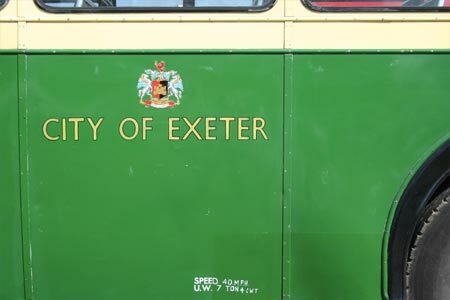 The City of Exeter name and coat of arms on the side of a double decker at a bus rally. The front destination of a double decker at a rally in the Paris Street station, during 2005. A Hookways coach outside St Davids Station. 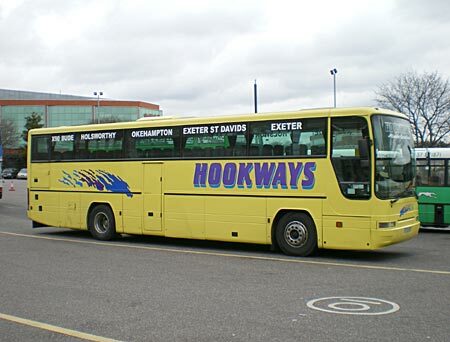 Hookways are the successor to Greenslades, who were founded in 1913, and based in Exeter for most of their trading life. They went through various merges before becoming Hookways Greenslades and now, Hookways. They still have a garage at Pinhoe. 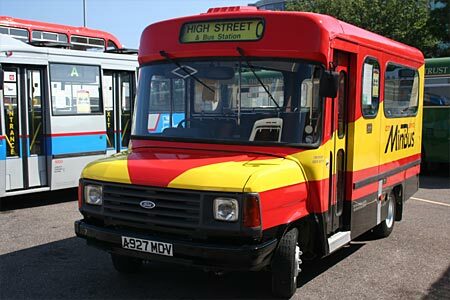 This bus is used on the Exeter, Okehampton, Holsworthy to Bude run, an important route in the days of the stage coach, when a regular service ran from the Bude Hotel, Paris Street to the Cornish resort. A Royal Blue, Bristol L6G/ECW, coach at the 2005 bus rally, just after it was fully restored to its original livery. It was registered in 1951 and operated until 1963 on the Associated Motorway routes. In 1951, Royal Blue was started by the Elliot Brothers in Bournemouth. The company coaches were a well known site in Exeter as they provided a service along the south coast and day trips around Devon. UFJ295, a 1957 Guy Arab IV chassis with a Park Royal body. Photographed at the Paris Street rally in 2005. Some single decker Devon General buses photographed in November 1972 at the Paris Street bus station. Photo courtesy of Alan H Mazonowicz. 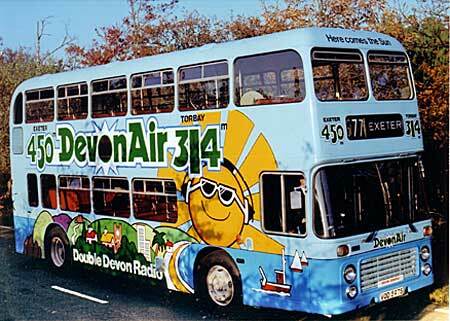 The commercial radio station, DevonAir started broadcasting in Exeter and Torbay on 12 December 1980. Their studios in Exeter were in St David's Hill. To advertise the station, this bus was used on the Torquay to Exeter service from about 1980. Photo courtesy of David Smith. 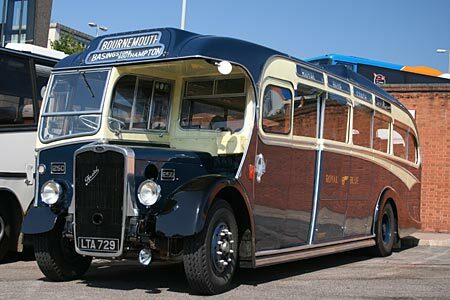 One of the early Devon General minibuses that were introduced in Exeter. The city was the first in the country to use minibuses based on the 16 seater Transit. A later and larger Stage Coach CityBus at the 2005 rally. A recently photographed Park and Ride service operated by Cooks Coaches, in Paris Street. This route runs from Sowton to encourage the use of the bus, and keep cars out of the city. Sources - Exeter and Taunton Tramways by J B Perkin, Exeter Trams - April 2005 published by the West Country Historic Omnibus and Transport Trust, petergould.co.uk website, Trewmans Exeter Flying Post and the Express and Echo.